Kim works with students to identify and apply for a broad choice of study abroad programs. He also meets with University faculty in the design and administration of travel-study programs, individual course approvals for students, and the internationalization of our campus. He has traveled to nearly 40 countries and led dozens of international educational programs in Europe, the Caribbean and Southeast Asia. Kim holds a Master of Education degree from the University of Illinois, with specialization in online learning. He has taught history and writing in the online format. Linda works with both international and domestic students. Prior to joining the staff at the Office of International Affairs in January 2013, Linda taught in the Edwardsville Community School District for 35 years. She graduated from SIUE with a Bachelor of Science in special education and an Master of Science in instructional technology. Gaby manages pre-arrival, arrival and retention activities for new international students at SIUE. She also serves as Designated School Official (DSO) and Alternate Responsible Officer (ARO) for F-1 and J-1 students. Gaby is an SIUE alumna and holds a Master of Arts in applied communication studies. Diane is responsible for maintaining and processing all fiscal transactions related to International Affairs, including international student services, study abroad, international affairs accounting, personnel and expenditures. She also oversees scheduling of the office graduate assistant and student workers. She thrives when the office is busy with international students arriving for orientation, during preparations for International Night or when a new group of students is leaving to study abroad. Diane has great relationships all over campus. If she doesn’t know the answer to a question, she likely knows someone who can answer the question. Cheryl serves as the Lead Immigration Specialist (PDSO) for the F student program and Alternate Responsible Officer (ARO) for the J exchange visitor program. She works with international students and visiting scholars on campus to maintain immigration status and reach their goals at SIUE. Cheryl has a background in student services including admissions, records and counseling. She holds a Master of Science in Counseling and Psychology from the University of West Alabama. Amy serves as Responsible Officer (RO), advising J-1 students and visiting scholars. She also serves as Designated School Official (DSO) for F-1 students. Amy has worked with international students as an immigration advisor, student services coordinator, and ESL instructor. She is a Returned Peace Corps Volunteer and holds a Master of Arts in TESOL/Applied Linguistics from the University of Illinois at Chicago. 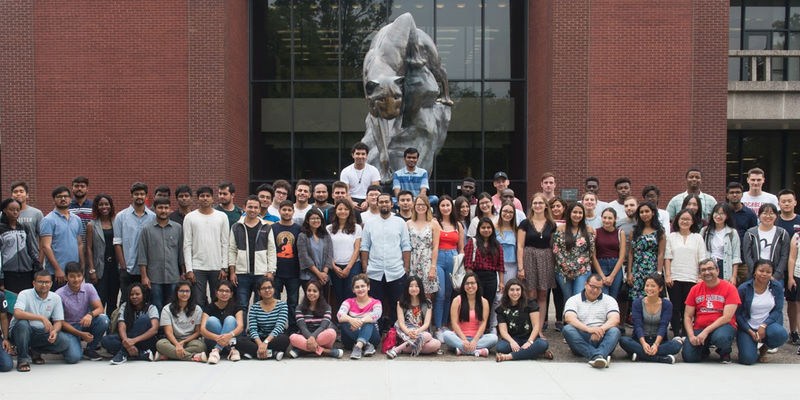 Dr. Weishaar oversees International Affairs at SIUE, including international partnerships, study abroad, immigration services for international students and scholars, and collaboration with constituent groups to promote international education. She received two Fulbright Scholar Awards, one to teach and conduct research in Kiev, Ukraine and one to participate in an international administrator’s seminar in Japan. Dr. Weishaar is a full professor and was previously associate dean in the School of Education, Health and Human Behavior. She authored or coauthored six books in special education administration and assessment and over 15 articles in special education and international education. She has traveled to over 20 countries on five continents. She holds a Doctorate of Philosophy in Education from St. Louis University. Chin is a graduate student from Taiwan studying Learning, Culture, and Society. She loves traveling and experiencing new things, and has been to many different countries in the world so far. This is her fist time living in America, and she experienced homesick and culture shock in the beginning. Therefore she can feel related to new international students who just get here. She is looking forward to meeting you all in the Office of International Affairs as well as on campus. Please don't feel shy saying hi to her. Claire is an undergraduate student at SIUE who is majoring in social work. She has recently spent a semester in London, England and traveled as much as she could and has an interest in new cultures, new people, and new adventures. She is also the president of the Global Ambassador Programs which encourages SIUE students to get acquainted with international students.